· Tragus: 6-8 Months healing time, $25 + jewelry which starts at $30 for an 18 gauge titanium curved barbell. 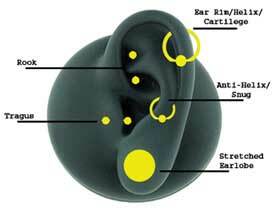 · Anti-Tragus:6-8 Months healing time, $25 + jewelry which starts at $30 for an 18 gauge titanium curved barbell. 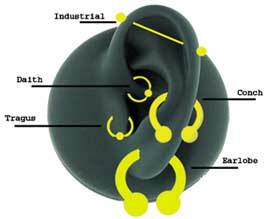 · Daith: 6-8 Months healing time, $25 + jewelry which starts at $30 for an 18 gauge titanium curved barbell. · Rook: 6-8 Months healing time, $25 + jewelry which starts at $30 for an 18 gauge titanium curved barbell. It is recommended that there be no jewelry changing for 8 months. · Conch: 6-8 Months healing time, $25 + jewelry which starts at $25 for an 18 gauge titanium straight barbell. · Helix/Cartilage/Ear Rim: 6-8 Months healing time, $20 + jewelry which starts at $10 for an 18 gauge surgical steel captive bead ring. 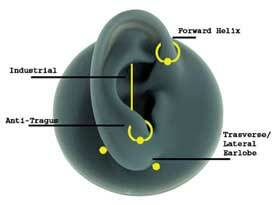 · Forward Helix: 6-8 Months healing time, $20 + jewelry which starts at $25 for an 18 gauge titanium straight barbell.